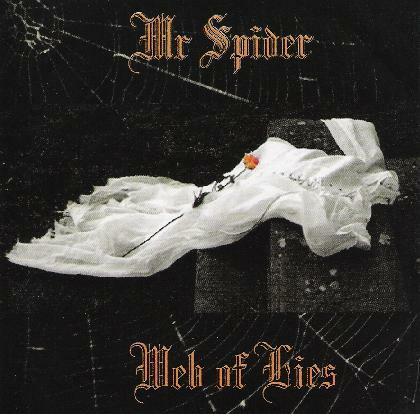 Mr Spider - "Web of Lies"
I'm sure most Aural Innovations readers know Andy G and his Dead Earnest label, and may find his newest release a bit of a surprise, given that this isn't a space rock band. But if you visit the Dead Earnest site you'll find that Andy has been active promoting the local music scene in Dundee, Scotland. And among the Dundee locals is the blues rock band, Mr Spider. The band are the quartet of John "Fox" McNairn on guitar, Mike Fenton on bass, Paul Reoch on drums and Michele Mclaren on vocals. The music is a pretty basic brand of blues rock, though the songs themselves are solid, including all the expected blues rock themes like drinking, gambling, and the trials and tribulations of love. The best tracks are the ones where McNairn cuts loose on guitar… the ballsy instrumental "Purple Shade of Gray" and "Bottle Blues" are standout tracks. And I dig the nasty slide guitar on "Sugar Lane" and "Running Man". The last four tracks of the set make up the nearly 18 minute "Tears For Bethany" suite, which includes some of the most ambitious and well played music on the album. The band stray quite a bit from their blues rock core during the suite, making for a much more interesting listen. In summary, as blues rock bands go Mr Spider are pretty basic, and Mclaren isn't the most powerful or passionate of singers, which is kind of a must with this kind of music. But if you listen with an ear toward the bar band aspect then you'll find Web of Lies to be a good fun listen and I've no doubt Mr Spider are rocking live act. The set list link on their web site features a great mixture of original and cover songs. For more information you can visit the Mr Spider web site at: http://www.mrspider.co.uk. Hear Mr Spider at their Myspace page at: http://www.myspace.com/mrspidersblues.